Experts in the rehabilitation of the upper extremity (hand, elbow or shoulder). Post surgery or injury of the upper extremity, requires a therapist with a unique and advanced skill set. That includes knowledge of the latest advances in micro surgery and post operative rehabilitative treatments. The skilled therapists Health Quest Therapy (formerly Maui Hand Therapy), using proven therapeutic interventions restore function to the upper limb in order to return a person to their highest possible capacity. Not sure if you need a Certified Hand Therapist (CHT)? 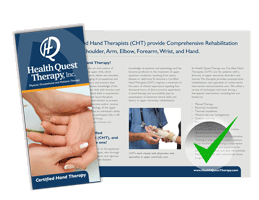 Find out more by downloading a copy of our Certified Hand Therapy brochure and learn why working with a CHT may be your best option for a complete functional recovery. Treatment plans at Health Quest Therapy (formerly Maui Hand Therapy) follow evidence based practice. Our treatment plans are designed to include the necessary time, frequency, and intensity needed to achieve optimum results.